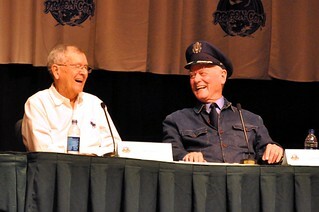 I'm really glad I got to see Larry Hagman at a con two years ago, and had a chance to chat briefly in person. His animated joy at having spent so much of his life portraying great characters was inspiring, and infectious. Mr. Hagman died this afternoon in Dallas. Apparently, they were in the middle of filming the second season of the "Dallas" reboot, and they've shot scenes with him for the first several episodes of the season. It'll be interesting to see how they write his death into the show. I sure hope they manage to go on without him, at least for a bit. He certainly wasn't "the star," but Jim Davis died of a heart attack in the middle of the original "Dallas" run, and they actually got months of plot intrigue out of patriarch Jok Ewing's "disappearance." They've also replaced actors a couple of times, most notably (and disastrously) when Barbara Bel Geddes couldn't keep working, and Donna Reed took her place. Somehow I doubt they can get away with that for J.R. I guess I'd known that he had announced last fall he was being treated for a "common and treatable" form of cancer, but he didn't beat the odds, I suppose. Patrick Duffy (Bobby) and Linda Gray (Sue Ellen) were reportedly at his side when he died. That's certainly a good thing. I'm also sad to see some of the coverage talking about Josh Henderson playing "J.R. Jr." in the reboot. A little fact-checking would show what anyone writing about the show already ought to know; "John Ross" is John Ross Ewing III, not Jr. Jok was John Ross Ewing Sr., and J.R. was Jr.
oh wow, I had no idea that Patrick Duffy and Linda Gray were with him, or that the people from that cast were so close! that's really sweet/cool. sad that he's gone, though. I grew up begging my parents to let me watch Dallas...they watched it but thought it was too grown up for me ;) so I only ever saw a handful of episodes.